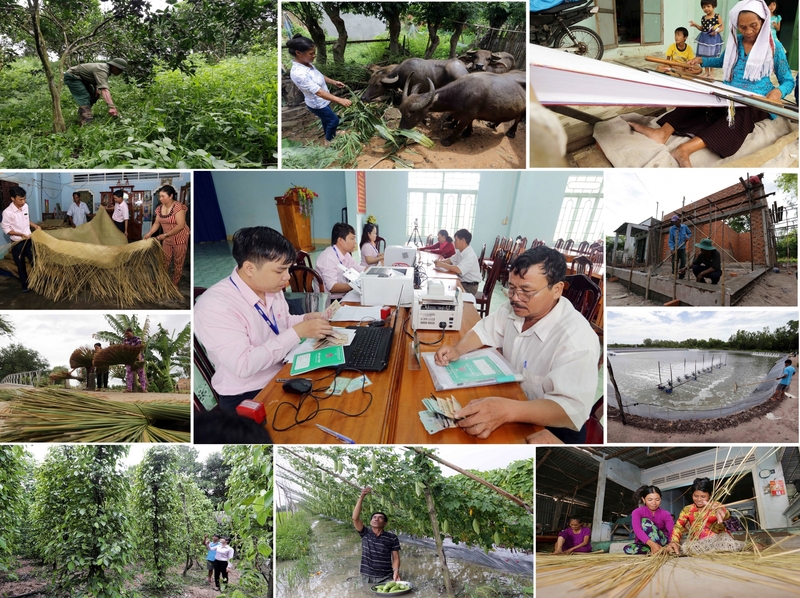 (VBSP News) The Vietnam Bank for Social Policies is ranked among the biggest micro-finance providers in the world, said the Asia-Pacific Rural and Agricultural Credit Association. The Vietnamese bank boasts seven million of customers in 11,000 communities across the country. Prasun Kumar Das, general secretary of the Asia-Pacific Rural and Agricultural Credit Association, was full of praise for Vietnam Bank for Social Policies (VBSP) in his recent visit to Vietnam. Behind this success are the non-stop efforts from the VBSP team to deliver superior products and foster creativity in their services. Right after his farming session at Song Tra commune, Hiep Duc ward, Quang Nam province, Ho Van Sy from the Ca Dong ethnic minority immediately changed into his best clothes to join the meeting held by VBSP. Sy could not hide his excitement when asked about the impact of VBSP’s policies in Hiep Duc ward. “I have to say thank you to VBSP and their credit for us. We’ve escaped poverty thanks to this funding,” said Sy. Song Tra is a remote commune, located in a mountainous area of Hiep Duc ward, where Ca Dong and Mo Nong ethnic people make up 43 per cent of the population. Transportation is difficult and the weather is always bad, but the Ca Dong people still vowed to escape poverty. Farmers like Sy have received loans with low interest rates, and received training on farming skills from the local agricultural council. Between 2007 and May 2018, 521 poor families have been granted a total of VND56 billion ($2.4 million) in loans. Half of these come from ethnic groups, and 256 households have spent the money on agriculture, husbandry, forestry, and services. Poverty is reduced and the social welfare at Song Tra improved dramatically. “We hope that VBSP will lend more money to ethnic minorities for rubber tree farming. This is a new challenge to help these poor famers escape poverty for good,” said Nguyen Hong Son, chairman of the Song Tra People’s Committee. Feedback from farmers like Sy or local regulators like Son is crucial for VBSP, which depends on feedback to improve their services. Besides going to each family to assess the impact of their loan programmes, VBSP also asked for comments from local farmers and regulators. In the event of natural disasters, VBSP has allowed farmers to delay their payment and even offered farmers some emergency funding to help them return to normal life. Duong Quyet Thang, General Director of VBSP, said that the bank highly values cooperation from local councils and organisations, especially in devising strategies to escape poverty and improve social welfare. Local authorities need to pay attention to the impact of these loan packages to make them work in their community. With this in mind, VBSP executives always made sure to connect with local authorities and organisations during their field trips. VBSP has made various recommendations to local authorities on how to reduce poverty. The chairmen of communal People’s Committees are usually part of the local VBSP team as well. Recent regulations such as Document 40-CT/TW also created a legal framework for these cooperation activities. To assist VBSP, local authorities have provided an office with facilities for VBSP staff, as well as funding from the local budget. Local authorities are encouraged to transfer some of their budget to VBSP and collaborated with the bank on micro-finance activities. At the recent meeting with VBSP, Huynh Van Sum, Secretary of the Soc Trang Party Committee, said that in the first half of 2018, the local authorities have transferred VND106 billion ($4.5 million) to VBSP, 8 per cent more than last year. The local authorities will continue to do this in the future to help poor people, as well as launch a separate programme for ethnic minorities. VBSP has transaction offices at 11,162 communes around Vietnam, ensuring that local residents can contact VBSP at any time and enquire or make payments easily. In the past 16 years, VBSP has given out VND500 trillion ($21.5 billion) of loans to 34 million poor households, helping 4.5 million poor households escape poverty and 3.6 million people find stable jobs. Approximately 112,000 workers have been sent abroad for employment. About 3.6 million students were also granted scholarships and 11 million local projects in rural areas have received the necessary funding. Despite this resounding success, Thang admitted that the fight against poverty is still ongoing. This requires collaboration from all levels of the Vietnamese government, from central to local authorities. “We have to constantly encourage local residents to make plans and escape poverty. There is a lot of work to do for all of us to eradicate poverty altogether in Vietnam,” said Thang.